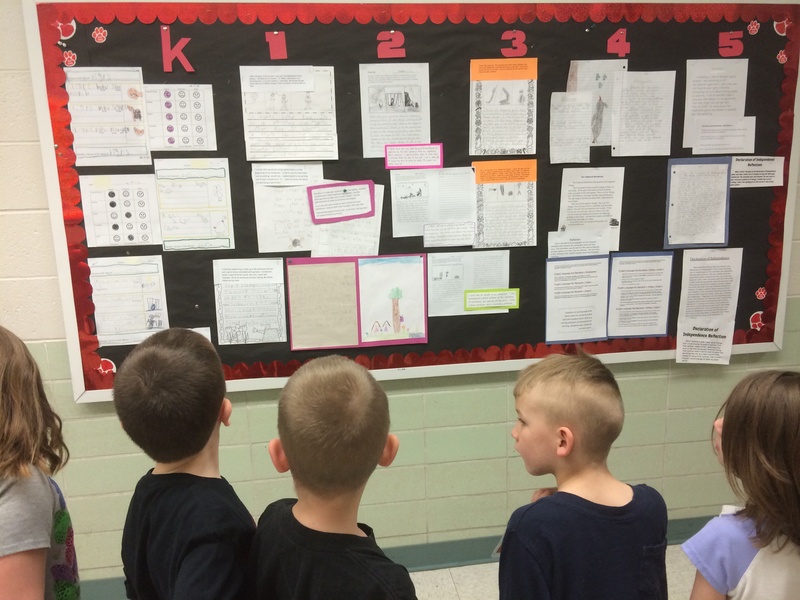 Students check out our mastery wall of writing while waiting for lunch. Teacher teams selected exemplary pieces of work at the mid-year point. if we but let it. vulnerable to the beauty of existence. Two literacy professors from the University of Albany shed some light on the origins of educational research and its relationship with instruction. The two main areas of literacy research, reading and writing, find their roots in practice. Donald Graves (writing) and Marie Clay (reading) conducted many of their studies within actual classrooms. Not only does this approach appear to have a longer and more reliable influence on collective instruction, it also “offers an agentive role for teachers in generating knowledge in practice”. In other words, teachers can feel a stronger sense of commitment and motivation about themselves as professionals when they are actively engaged in the process of applying knowledge about literacy to their craft. The Wisconsin State Reading Association published this action research article from a 4th grade ESL teacher out of Carpentersville, IL. JeanaLe used two protocols to teach her emerging bilinguals to have more authentic conversations with peers about the literature they were reading. While many educators are familiar with book talks, speed booking expands on this activity. Speed booking is set up like speed dating. Students prepare a brief book talk on paper, gather in two circles facing each other, and then sell a book they recently finished to the other student facing them. After a few minutes, students rotate to the next person. JeanaLe found that by using these engaging activities, many more students stated they enjoyed reading and were able to list a favorite author. Speaking of reading, are you going to the Wisconsin State Reading Association convention on February 5th and 6th in Milwaukee? If so, stop by the Digital Learning Lounge or one of my sessions and say hi! Ensure it is substantial work worthy of investigation. Make and protect the time to do this. Make sure educators feel valued for participating. Attend to the power and challenges of teams. Create room for local autonomy. This discussion about separating teaching and learning is a hot topic. How can we break down instruction into the essential elements of quality, without losing its “essence”? Then, when things are not going so well in the classroom, what type of feedback system will help that teacher realize these errors and subsequently make adjustments? Of course, the feedback needs to be handled carefully, as practitioners personally attach themselves to their beliefs and practices. All this in the name of accountability, it seems. But what if it could be more? What if teachers could position themselves as students of their own practices? One possible example occurred just this week. I was doing an instructional walkthrough in a second grade classroom during independent reading time. I observed a boy reading a title from the Dork Diaries series. I asked him why he chose to read it. “A friend told me about, and it is really funny.” “Was it my son?” I asked him (he is in this class, and also likes the series). He shook his head, shared another student’s name, and continued reading. While speaking with this student, I wrote our conversation down using a stylus and handwriting app on my iPad. Before I left, I informed the teacher that she has created a wonderful community of readers. It was obvious that she values giving time for her students to talk about their reading with each other in authentic ways. Once I was in the hallway, I emailed the teacher my notes so the feedback was timely. Both the teacher and I can use this informal observation as an artifact to support our professional goals of engaging students with meaningful literacy activities. Unfortunately, not every school situation takes a partnership approach to professional growth. We separate learning objectives from professional goals, which only seem to benefit those that do not work in our school. This misinformed idea that teaching and learning are separate entities can lead to separation between teacher and administrator, teacher and teacher, or even an educator with oneself. This cannot be healthy nor lead to high levels of student achievement. Even if a teacher does not have access to others who would support this type of work, he or she can take steps to advocate for themselves. First, take that learning objective and reframe it as a driving, or “life-giving”, question. Second, find support in the work practitioners have completed beforehand. As Johnston and Goatley note, the most influential studies have come directly out of the classroom. Third, conduct action research within your own setting, using evidence-based practices such as discussion protocols. Finally, share your findings with colleagues, in the desire of becoming better and to “take that needed shift”. In spite of any ill-informed initiatives that may come our way and attempt to distract us, we still have some control over the outcomes in our classrooms and schools. By taking an inquiry stance toward our important work, we can view our practice through more objective eyes. This will lead to improvement, not because someone or some system suggests that we needed to improve, but because we see the need through our students’ point of view.